Woodcut. 31 x 23 in. Woodcut. 23.25 x 19 in. Richard Haas’s expansive oeuvre is predominantly marked by trompe l'oeil murals and detailed renderings of New York City’s architecture. But before he began recording urban landscapes, Haas sought inspiration from German Expressionist printmakers and Abstract Expressionist painters. Included in the exhibition are prints produced between 1957 and 1964—a seven-year period that, in many ways, encapsulates the artist’s graphic evolution. While attending the University of Wisconsin-Milwaukee, a city heavily settled by German immigrants in the 19th and 20th centuries, Haas began studying German Expressionism. Informed by the emotive woodcuts of Emil Nolde, Max Beckmann, and Erich Heckel, Haas’s large-scale prints include abstract portraits of European artists and great thinkers. In the summer of 1960 Haas studied with the Abstract Expressionist, Jack Tworkov, at the University of Wisconsin-Madison. 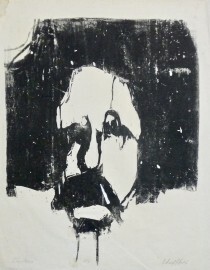 Through Tworkov’s urging Haas applied to the University of Minnesota Graduate School where he was offered a fellowship as Malcolm Myers’s teaching assistant in printmaking. 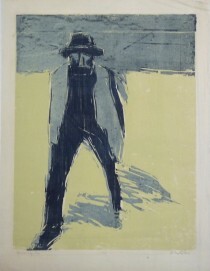 While studying painting and printmaking there he pursued a minor in Art History and became intrigued with the prints of Edvard Munch. Haas’s deep interest in 19th-century European history informs many of these early prints. Included in the exhibition are woodcuts from Haas’s Famous Heads series, comprising portraits of Henry VIII, Friedrich Nietzsche, Henri de Toulouse-Lautrec, Vincent Van Gogh, Claude Monet, Auguste Rodin, Paul Gauguin, and Albert Einstein. Expressionism in Print: The Early Works of Richard Haas, 1957-64 will be accompanied by a catalogue authored by Elizabeth Smith, Zvi Grunberg Fellow 2017-18. The Bruce Museum is grateful for support of this exhibition from Aundrea and Jim Amine, Kathy and Bill Georgas, Leah and Bob Rukeyser, the Charles M. and Deborah G. Royce Exhibition Fund and the Connecticut Office of the Arts.